It’s totally possible to save money on tickets to Disneyland. I recommend you do because there will be plenty of other options to spend money at the parks. Save what you can now. Let’s take a look at how you can save some money on your tickets. First, you can save up to $111 per ticket for travel now – May 23, 2019 (blackout dates April 14 – 22, 2019). Second, if you’re visiting after May 23, 2019, consider purchasing Extra Day Free tickets for travel from May 24, 2019 – December 31, 2019. Extra Day Free Tickets are good for your 5th day free when you purchase a 4 day ticket. These can be one-park-per-day tickets or park hoppers. Or, call 855.GET.AWAY to purchase over the phone. Save $500+ on Disneyland Vacation Packages when you travel most dates between until May 23, 2019. Use code DDaily to save an additional $10. Or call 855.GET.AWAY to purchase over the phone. Get Away Today tickets are open to guests world-wide. Pricing provided is in U.S. dollars. Tickets may be purchased online or over the phone at 855-GET-AWAY. Tickets for two or more days at the Disneyland Resort can be bought at a discount up to 24 hours prior to your first day at the parks. If you’re 24-48 hours out from your visit, call Get Away Today at 855.GET.AWAY to purchase. If you’re 3 or more days out from your visit, purchase online here. Tickets are sent electronically, which means you will take either your phone or printed confirmation straight to the gate. No need to go to a ticket booth to pick-up tickets! When you present your confirmation at the gate, a cast member will quickly take your photo and have you sign a physical park ticket. Every guest in the park will have a paper ticket. These can be used to enter the park, pull FASTPASSES, etc, etc. 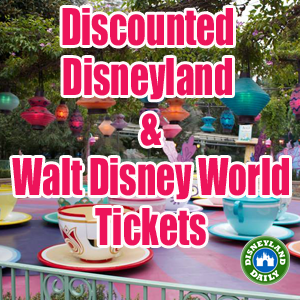 The tickets you purchase with Get Away Today are authentic Disneyland tickets. And just like purchasing through Disneyland, if you purchase a 3+ day ticket, you will receive entry into one Magic Morning at Disneyland Park. For more information on Magic Morning (and the difference between it and Extra Magic Hour), visit this link. Get Away Today has been partnered with Disney for 29 years and is a completely reliable source for discounts. I’ve been working with them for over 1.5 years, have sold thousands of tickets and have bought them myself. So, you’re safe! I guarantee it. If you have any problems at all, I’ll back you up. As mentioned above, you should wait until you receive your physical tickets at the Disneyland gate to attach them to your Disneyland app. Create an account at Disneyland.com. Download the Disneyland app to your phone. Log into your Disneyland account on your phone with the same info as you would use to log in online. Once you arrive at the Disneyland Resort and are ready to go into the parks, take your ticket confirmation purchase to the gates. A cast member will exchange your confirmation for tickets for every guest in your party. You will have a photo taken and you’ll be asked to sign the ticket. This process goes much quicker than you’re thinking, so don’t stress over it now. After you walk through the gates, take a moment to attach the paper tickets that you received to your app. This link shows you exactly how that’s done. Once you have your tickets attached, the option to purchase MaxPass will pop up on your screen. The process to purchase it is super simple. This video walks you through how to purchase MaxPass and then how to select your first FASTPASS via MaxPass. (Note: the video mentions the original, limited time pricing for MaxPass, which was $10 a person. It’s now $15 a person.) For everything you need to know about MaxPass, go here. Adding your tickets and buying MaxPass will only take a few minutes after you walk in the gate. I typically go in and to the far right or left so as not to stop incoming traffic behind me. Get organized and then continue on with your day. Want to take care of everything at once? Allow Get Away Today to book your discounted hotel, theme park tickets, and more. Get Away Today partners with Disney hotels and the best off-site hotels to provide you with so many great options for your visit. Many of the hotels they work with have extra perks exclusive to Get Away Today guests only. Enjoy free parking or free breakfast at some of their off-site hotels. Visit this link to look into all of these options. It’s an easy, stress free experience! Use code DDaily to save an extra $10 off your package. Whether you’re booking a full vacation package or just theme park tickets, you may use the interest-free Layaway Plan when you purchase with Get Away Today. Put $175 down to secure your purchase and then make payments when you want and for how much you want up until 5 days prior to traveling. You may set up your Layaway Plan online or by calling 855.GET.AWAY. There are many ticket sellers out there that promise great pricing, but can actually leave you with fraudulent tickets. I can’t think of a worse way to start your trip – or end it, really – depending on if you could even afford to replace those tickets. Absolutely do not buy tickets off of Craiglist or similar sites that are not run by reputable, Disney-approved ticket sellers. Single Day tickets must be bought directly through Disneyland. When you purchase through Get Away Today, I receive a small commission. Thank you so much for supporting my site! All one day tickets (one-park-per-day or hoppers) must be purchased through Disneyland directly. Use the Disneyland app to buy these. Visiting Disney World (the one in Florida) instead of Disneyland (the one in California)? Get Away Today can help with that, too. Find discounted tickets for WDW at this link. Or, call 855-GET-AWAY to purchase. If you are looking for info on how to plan your trip, ask for help when you call. Get Away Today has many WDW experts on staff and can help guide you through a trip to Orlando. I’m traveling to WDW three times a year now, so I’m happy to help you, too. To get started planning a trip to the dark side Walt Disney World, visit this link. Hi Casey. We have multi day tickets we bought through get away today for one park per day. I’m thinking about doing a park hopper, but only for one of the days (does that make sense?? So like 3 days of one park per day but the last day a park hopper.). Can I upgrade a multi day ticket to only have one day as a park hopper? Our family is headed to Disneyland next month for the first time. I purchased 4-day park hoppers from GetAwayToday, but am wondering if it is possible to add a day once we get there due to the nighttime entertainment only being offered on weekends. I’m thinking we may want to squeeze in fireworks or fantasmic even though our flight gets in late afternoon. I’m having trouble figuring out if this is possible with tickets bought from a third party? Thanks for all your help! Absolutely. You purchased authentic theme park tickets just as you would direct through Disneyland. Go to the ticket booths to add on an extra day. You’re set! Hi! I was looking at getting the character dining vouchers through get away today but not sure how to redeem them? Also, what travel date(s) do I enter? Just the day we have our reservations?? Thank you so much for your site! It’s helped us so much with planning! Is parksavers.com com still a reliable way to get discounted Disneyland tickets in 2018? I don’t recommend them anymore. Get Away Today is definitely my preference. Park Savers doesn’t provide the attention and service that I’ve found to be the norm with Get Away Today. They’ve been partnered with Disney for 28 years and are the best at what they do. We are planning on going to Disneyland either the end of September or the first two weeks of October 2018. Three adults, no children. When is the best time to buy tickets? Would be going for 3 days, most likely during the week including a Friday. Keep checking that link I have in this post that shares the best current deals. You could buy them at any time, really. But, I’ll make it prominently known when one is much better. Kids at Adult prices is ideal. But, that isn’t a fit for you. There will be other sales. Also, stay tuned for info on Halloween Parties. Disney shares those dates and tickets for sale usually in July. how would I buy a maxpass with this. Doesn’t seem to be an option on the website so I assume I wouldn’t be able to until im in there which would take up more time? If you buy tickets from a discounted seller, it’s easy to add MaxPass to it. Once you get your tickets, scan them into your app. Then, when you walk into the park and open your app, you will be asked if you want to buy MaxPass. It takes only a few seconds. We bought our tickets from Parksavers last year and we had a great experience. We’re going in September this year and want to add Maxpass to our tickets. Do you know how that works? Last year we took our printable Parksavers tickets to the ticket booth on the Esplanade the night before our first park day and traded them in for our Disneyland park hoppers. Would we be able to add the Maxpass option to our tickets at that point or would we have to wait until we get to the turnstiles at park opening? Thanks for your help! With any discounted ticket seller, you will have your tickets prior to arriving. This post details how Get Away Today can actually deliver them to you prior to even traveling to Disneyland, based on when you purchase them. Either way, once you have your tickets, add them to your app. Then, when you walk through the turn stiles and open your app, you will be prompted to purchase MaxPass. It takes only a few seconds to buy it on the app. came across your website. Is there any valid discount code or current offerings for reduce pricing of Disneyland tickets? This post actually includes links to reduced tickets. I bought actual tickets from Get Away Today, and they arrived in the mail. they are on a good card stock, perforated to separate, but i’m wondering how that will hold up in the fast pass machines? in your walk-through your annual pass is hard like a credit card. while this is a thicker card stock.. it is still paper! do i exchange them for credit card style tickets inside? thanks for your help and great site!! Paper tickets will work fine in all the machines. Don’t stress. Many guests use paper. You’ll be ok! Hope so! Likely not until the fall, though. I’m so sorry! Still great prices here, though. And, if you’re buying 3+ one park per day tickets, they’re e-tickets, so you can go straight to the turn stiles. Help!! I just tried to use your discount code today and it won’t work. PJ, I’m checking with the owner to see what’s up. Should have been working through the end of today. I’ll be in touch asap. Unfortunately, no. 🙁 Disneyland changes pricing for one day tickets now, so outside companies can’t sell these. Thanks for your kind words! Do you know if you need to buy a ticket for a child that turns three during the trip (but was two when the trip started)? Technically, any child over the age of 2 at Disneyland requires a ticket. But, you should be OK if it’s just a day or so within your trip. Just got my tickets using parksavers. One child, one adult, 4 day single park ticket with the DLR code…$20 cheaper than Disney’s site! Thanks for the code! If I’m staying at a hotel with a Disney Desk, can we pick up tickets there with our Parksavers purchase? You could try, but I only know that the three Disneyland Resort Hotels exchange confirmations. I just tried using the Park Savers promo code, which is suppose to be good thru today (12/31/16), but it says it’s already expired?? Any help? I’m contacting the owner now. Send me an email at Casey@DLRPrepSchool.com and I’ll help you get the savings since you should have been able to purchase at that rate. Same thing happened to me. I pushed my luck right before midnight but still didn’t work. Luckily it’s only $6 off for us but any savings is nice! Jaime, send me an email at Casey@DLRPrepSchool.com. I’ve contacted the owner about a refund. Is there a benefit to buying your ticket a month in advance or should I wait till it gets closer? Can DL stop selling tickets because they’re at max capacity and does this usually happen if we’re going at the end of January (not a busy time)? They won’t stop selling prior to a capacity day. And those are rare. It won’t happen at the end of January. The advantage to buying now is that you’re locking in these rates and using the additional discount. It won’t be good after 12.31.2016. With the multiple day passes, is it consecutive days? Hi, Danielle! They have to be used within 13 days of the first activated day in the park. They don’t have to be consecutive. Thanks for your helpful Prep School! Is there any where I can get a discounted 1-day ticket? My DH can only join us for 1 day. No one sells discounted one day tickets due to tiered pricing. 🙁 Must buy from Disneyland. Wish I could help! Hi, Desiree. The days after Halloween are less busy than the actual holiday. Wednesday and Thursday would be best. Park hoppers are a great option to be able to go between parks and having a half day at DCA is perfect. You’re all set! Thank you for the DLRPS code! I’ve purchased the 5 day hopper tix via your link, so can’t wait! Your site is amazing and my family and I will be studying all the articles over the coming weeks before our adventure to DLR. Hello! We were given 4 day tickets for Disneyland at a school raffle. I know I can apply them/their value towards a 3 day park hopper pass if I go to the ticket booths. However, we want to stay at a Disney Hotel to get all the days early admission. Is it possible to buy tickets via the hotel at check-in and use the day tix we already have towards the hopper pass? You should be able to upgrade to a 4 day hopper pass, but I’m not sure about trading in a 4 day for a 3. I’ll ask at my next visit and post on Facebook.com/DLRPrepSchool what I learn. We were told to get our tickets from them and Im kinda worried. We have never bought tickets thru a company other then Disney or at our hotel. I will save parksaver for our future ticket purchase. I trust and believe you would NEVER lead anyone wrong. These tickets are safe to buy. I wouldn’t risk the business I have built for a misleading sale. 🙂 But I completely understand your concerns. You can check the comments for info from previous purchasers. We will absolutely be buying our tickets thru park saver next year(bought this years already) we were charged a fee thru the other. I have family who needs to get their tickets so I sent them this awesome info. Thank you so much. P.s we will be there Dec 4-10 would LOVE to see you if times permit. I’m thinking of getting annual passes. If I buy park hopper passes from Park Saver, can I convert that on the same day I go to Disneyland to AP’s and save money? Would they deduct from cost I paid for tickets or original price they sell for. Incidentally, we’re also going to be staying at Paradise Pier. Trying to get biggest bang for our vouch with 4 kids. Thanks for your help. When you buy from Park Savers, you’re buying actual Disneyland tickets. And you may convert those tickets to APs just like you can tickets you buy from Disney directly. Once you hand over your purchase confirmation, you are holding authentic Disneyland tickets like anyone else who bought full price. They won’t know the savings you had with buying through Park Savers, so you’ll essentially be buying an AP for less than what most people will. Smart move! Hi Casey, I just purchased tickets for August through Park Savers and it says on my confirmation email that I can take my eticket (printed or smartphone) directly to the turnstiles and that I don’t need to stop at the box office. Is this true? Yes. Some of their tickets go directly to the turnstiles. You’re good if you got that in your confirmation! Thank you so much! And by the way, I love, love, love your site. I’ve been studying it for our trip and using all your tips and I know we’ll have a much more successful trip because of you. Keep up the great work! You’re pretty awesome. Planning a trip in Sept. (16th&17th), i have be considering getting my tickets thru Park Savers, but am wondering if it will be worth the savings to have to wait in line each morning to get park tickets? I only have the two days and want to maximize my morning hours as much as i can. Other than that, I will most likely be going solo those two days and was wondering if you have any tips or recommendations for doing DLR by yourself? Finally, do you have any idea if the Fall/Halloween decorations will be up by then? Thanks! Hey, Cole. Totally valid concerns. However, you only have to take your confirmation to the ticket booth the first day (or night before) of your visit to turn it into an actual park ticket. Then, you’ll be set for both days. So is it cheapest/best to wait and purchase our tickets three days prior to our trip? Or earlier? For some reason the article is reading to me that I should wait until three days before, no? It’s cheapest to order at least 3 days out. Ordering now is the best way – you don’t have to wait until 3 days prior. It’s simply 3 or more days prior. If you want until 2 days prior, you will pay a bit more. Hi hi Casey! I’m trying to convince a friend from LA (I’m from Texas) that it is safe to use Park Savers to purchase our tickets. How do I go about proving that we won’t get ripped off or that these vouchers will work (June 2016). Since there are a lot of horror stories about people getting ripped off and since we want to buy 2 Day park hoppers and we’re college students, dropping that amount of money tends to be scary. Like is there anyway I can show that they are disney safe – other than reviews? thank you! Hi, Elena. Totally valid concern and you’re smart for inquiring. I would look at the comments on this post for confirmation and find comfort in that. You can also search on Facebook for my past posts that include a link to the discounted tickets and then how many readers have used this resource. I have purchased from them, too. They’re safe. But I understand the concern! Let me know if you have any other questions. We are planning our trip with family this fall and have found your site to be an excellent resource! Hoppers are nice to have for sure. And you only get the magic morning with the 3+ day park hopper. Has to be a hopper. Can I say hopper more? Let me know if I can help with anything else! I don’t think that is correct. You get Magic Morning with any 3+ Day pass hopper or not according to the Disneyland site. I also got a magic morning on a 4 day one park pass last year. Thank you, Brent. I just caught this recently and have been meaning to correct. Going to do so now. I appreciate your comment! The magic morning that goes with the 3+ day park hopper is good at Disneyland Tuesday, Thursday and Saturday, regardless of where you stay. Yay! Love them. Such a great, safe resource. Our first day is going to be a half day. We arrive at the airport at 9:10 a.m. We will go to the parks as soon as we can, but obviously it will be at least midday. I’m wanting to get an idea how long we may have to wait in line to get our tickets. It varies, depending on what time of year you’re visiting. Mid-day lines are better than morning because many people are in the park by mid-day. So, I would estimate 20 minutes. Take this time to put sunscreen on, have kids go the bathroom, etc, etc. Enjoy your visit! Thanks! We will be going in October. A second – sort of follow-up – question. Is the only way to get the electronic tickets through Disney directly? That I know of, yes. Occasionally Park Savers will have them – at this same link – but not always. Great question. Some people don’t know about this option. (I didn’t until I started this site.) Some don’t trust a 3rd party, which is a fair concern, as there are some shady sellers out there. I always tell people that your peace of mind is worth more than the savings. If you just don’t feel comfortable with it, don’t do it. This site is safe, however, and you can come to me if you have any issues at all. I’ve never had anyone do that, but I would certainly help you out if the need arose. I have bought tickets from them and hundreds of readers have, too. I’ve been working with Park Savers for a while now. They’re good people. Thanks so much for your response Casey! It gives me peace of mind to hear it’s a valid concern! Lol! Just a question on the exchanging of tickets, and I apologize if you covered this! We are going 6/2-6/5/16 (at the parks on the 3rd and 4th), so plenty of time to plan! We are planning on getting to DLR super early on 6/3 and going right away once the park opens to register our kiddos for the Jedi Training (your Star Wars Season post has proved invaluable!! I’ve been trying to plan starting with all the Tomorrowland stuff as you suggested, as my 4yo and 7yo are total Star Wars groupies!!) Since we are staying at the hotel (not onsite, but close by) the night before, is it necessary to make a trip to exchange the tickets the night before? Or can we do it in the morning? And if so, how late are the ticket booths open at night, and how early in the morning do they open? Just trying to figure out my best options!! I just wanted to see if you had an answer about the ticket booth times, and the best way to exchange for tickets? I’m so sorry! I posted the info on Facebook. Ticket booths open 1 hour and 15 minutes prior to park opening and stay open one hour past close. I recommend going the night before if your schedule allows. Did you have any other questions? Happy to help! No problem! Thanks for your quick reply, I must’ve missed it on fb 🙂 I did have one other question…if we come the night before (my plan for sure! ), can my husband get me close to the ticket booths so I can jump out and get in line? I won’t have to pay parking just to do the tickets, will I? I just love your website. Thank you for all the information. I am going to be purchasing my tickets through your link. We plan our first day at Disneyland to be May 2nd. Should I put my date as May 1st so I can exchange them the night before? Or does it not matter? We want to exchange them the night before, rather than the morning of. Thanks so much! Thanks, Amy! It doesn’t entirely matter, but I would put May 1 down. Please let me know if I can help with anything else! One more question. We will be at Disneyland/ California adventure next week Monday and Tuesday. Which park should we go to on Monday and which one Tuesday? Is it better to go to Disneyland on a day that doesn’t have magic morning? Thanks for all your help!! If you do not have magic morning, it’s ideal to visit the park that does not have it that day. Disneyland’s early entry options are on Tuesday, Thursday and Saturday. California Adventure are the remaining 4. So, on Monday, go to Disneyland. Tuesday, California Adventure. Hope that helps! Hi Casey! Does Disneyland still sell late day tickets? A friend was telling us about them but I’m not sure how to purchase them or if they sell them anymore. Would you recommend a SoCal pass if we also plan on doing Legoland and San Diego? How do fast passes work with this? FASTPASSES are not affiliated with Legoland or San Diego. The SoCal pass is a great value if you plan on visiting several of the locations offered on its list. Many people really enjoy it, too. Do we have to get park tickets printed at the park then? Do you put your socal pass into the fast pass machine to get your fast passes? I guess the question is how do the SoCal passes work once at the park? The SoCal pass is completely separate from your Disneyland tickets. You will take the confirmation email after purchasing your Disneyland tickets to the ticket booth to exchange for Disneyland tickets. Then, those will grant you entry to the park. Is it a long wait to exchange the confirmation for tickets? It depends on when you go. Visit the night before if you can and if not, arrive at least an hour prior to opening (which I recommend even with tickets) to make sure you get them in time. I’m not visiting the parks until mid May, but I wanted to buy my tickets as soon as possible. Is there a reason they have to be purchased 3 days in advance? Could I purchase them now for my visit in May? Thank you! Yes. You just have to buy them within 3 days of your trip for processing. Go for it! I you buy tickets with ParkSavers do you still get the early entrance for one day with a multi-day ticket? Absolutely. They are authentic Disneyland issued tickets. They work exactly like Disneyland tickets, so a 3+ day park hopper will get you into the magic morning. I was looking to purchase some character meal tickets through get away today. I like to have as many things paid for as possible before I actually arrive. Is this something you recommend? Check the prices. I recently helped another reader and they were actually higher with the Get Away Today group vouchers compared to purchasing through Disney. If they are lower, go for it. But, be sure you’re saving money. If you go down the night before to exchange tickets, does every person with a ticket need to be there? No. Just one person can exchange all the tickets. Good question.